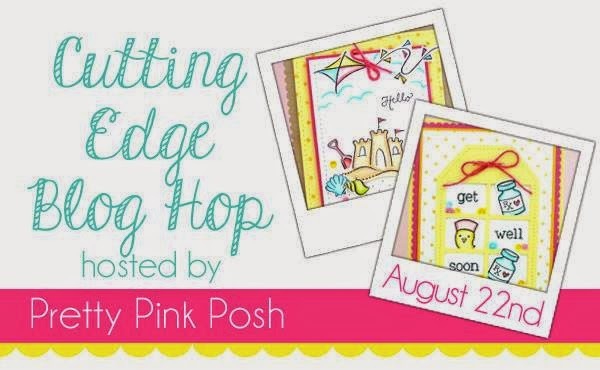 Pretty Pink Posh is having a Cutting Edge Blog Hop this weekend. You can create a project that incorporates at least one die and upload it over here. I made another Christmas card for the hop, this time using a lot of Distress Inks and some Phrase Bubble Dies from Hero Arts. I created an ombre background using Distress Inks in blues and purples and sprayed the piece with Perfect Pearls for a little shimmer. I gathered up an assortment of holiday sentiments from Hero Arts and stamped them onto a bunch of die cut Phrase Bubbles. I added some tiny snowflake images onto the die cuts and added little dots of Stickles to the centre of each snowflake. I think this is a fun nontraditional holiday card and will likely create some more Distress backgrounds in other colours to make additional cards. I'm also entering this card at A Blog Named Hero for the Ombre Challenge. Thanks for stopping by and wishing you an inky weekend! What a fun card Sue. Love the gorgeous background! Hi Sue very fun card! Great background. Perhaps you want to link up to ABNH, current challenge is Ombre, link here: http://ablognamedhero.blogspot.ca/2014/08/challenge-50-ombre.html. Gorgeous inking!! Love the Speech Bubbles design for the Christmas card! Happy weekend, Sue! I'm starting to panic because I haven't started on christmas project's yet. But your card just gave me a wonderful idea! Love the beautiful background and contrasting white die cuts, really, really pretty. I love how you used the Speech Bubbles for a Christmas card, Sue! It's beautiful! Very fun with all the speech bubbles. Awesome card, Sue! Such a fabulous way to use speech bubbles and your background is gorgeous! Love this Sue! Fabulous creation! TFS! Great card! Love the ombre background for all those phrase bubbles! Really cute effect! your ombre is outstanding~ love the speech bubbles! Love how unique and fun this is! Gorgeous inking! I love the Perfect Pearls and the snowflakes on the speech bubbles! So pretty! LOVE your shimmery ombré background! Great way to use speech bubbles. Beautiful background & fun card, Sue! Very very pretty. Thanks for participating in the Ombre challenge at A Blog Named Hero! I love blue for the holidays, and the speech bubbles are a really great idea. Thanks so much for playing along at A Blog Named Hero! Amazing Christmas card! Love all the speech bubbles and the sparkle in the background! So cool! I love the ombre background and using all those talk bubbles? Genius! !